In a calculus market-research study conducted in 2008, calculus faculty pointed out three critical components to student success in the calculus. The most critical is mastery of the prerequisite algebra and trigonometry skills. Our market research study showed that 58 percent of faculty mentioned that students struggled with calculus because of poor algebra skills and 72 percent said because of poor trigonometry skills. This is the number one learning challenge preventing students from being successful in the first calculus course. The second critical component for student success is a text that presents calculus concepts, especially the most challenging concepts, in a clear and elegant manner. This helps students see and appreciate the beauty and power of mathematics. Lastly, calculus faculty told us that it is critical for a calculus text to include all the classic calculus problems. Other calculus textbooks may reflect one or two of these critical components. However, there is only ONE calculus textbook that includes all three: Smith/Minton, 4e. Read on to understand howSmith/Minton handles all three issues, helping your students to see the beauty and power of mathematics. 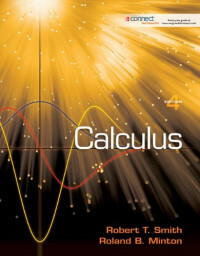 Now in its 4th edition, Smith/Minton, Calculus offers students and instructors a mathematically sound text, robust exercise sets and elegant presentation of calculus concepts. When packaged with ALEKS Prep for Calculus, the most effective remediation tool on the market, Smith/Minton offers a complete package to ensure students success in calculus. The new edition has been updated with a reorganization of the exercise sets, making the range of exercises more transparent. Additionally, over 1,000 new classic calculus problems were added. This handy book from the Essential Managers series is packed with relevant tips for today's competitive business world. Includes hundreds of photos, charts & diagrams.